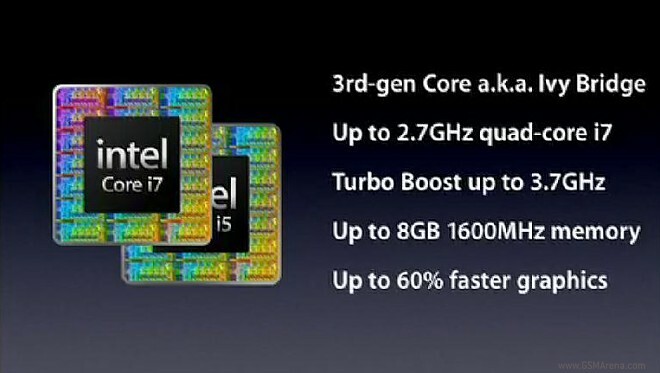 The MacBook Airs now can be rigged with processors up to 2.0Ghz dual-core i7 (with Turbo boost up to 3.2Ghz). The RAM options go as high as 8GB and the SSD options reach the spectacular 500GB. That’s 500GB SSD. The read speeds for the SSD drives has gone up to 500Mbps too, so it’s double the one on the current SSD drives used in the Airs. The USB ports on the Air remain two, but they are both USB 3.0 now. Another thing that’s changed that both laptops now use the newer Intel HD Graphics 4000 instead of the previous 3000 model. The front-facing camera has also been updated to 720p allowing FaceTime HD video conversations. 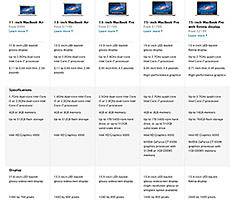 The screen resolutions for both the 11-inch and 13-inch versions remain the same. The graphics have been updated with new integrated solution that’s up to 60% faster. 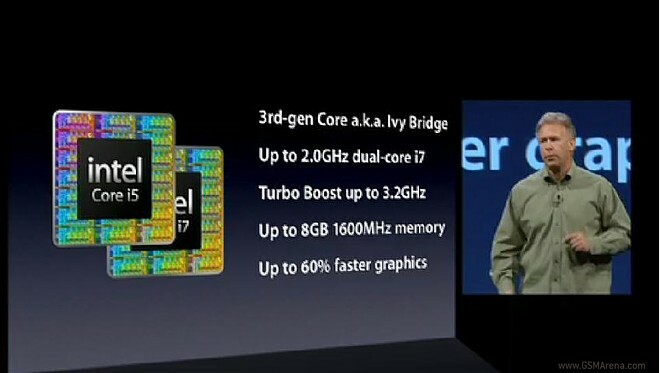 The MacBook Pro’s have similar updates with the CPU’s bumped up to the current IvyBridge lineup by Intel. The top model gets a 2.7Ghz quad-core i7 (with turbo boost up to 3.7Ghz). The computer can be had with up to 8GB of RAM. The USB ports are again 3.0. The discrete graphics for the 15-inch version is new too – it’s the Kepler-architecture Nvidia’s GeForce GT650M with up to 1GB of memory. It’s supposedly 60% faster than the current discreet graphics as well. The updated lineup is ready to ship today and the base prices are now $100 cheaper. 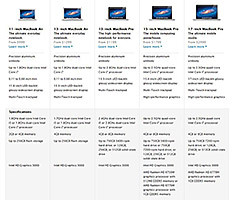 In case you are interested, here are two tables showing the specs before and after the update.